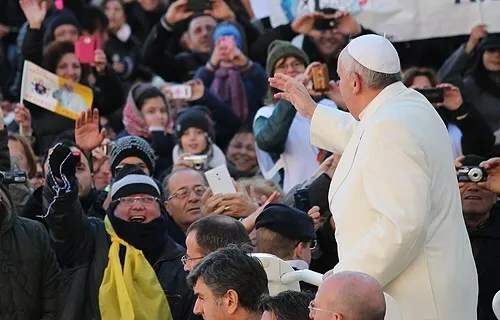 Pope Francis greets pilgrims in St. Peter’s Square Dec. 4. Credit: Kyle Burkhart / CNA. “The internet is a widespread reality, complex and in continual evolution, and its development re-proposes the ever-present question of the relationship between faith and culture,” the Pope said Dec. 7 to the participants of the council’s 26th plenary assembly. “Already during the first centuries of Christianity, the Church wanted to face the extraordinary heritage of the Greek culture. Facing a very profound philosophy and an educational method of exceptional value, but soaked in pagan elements, the (early Christian) Fathers were not closed to debate, but on the other hand neither did they surrender to compromise with certain ideas contrary to faith,” the Pope explained. “Between the opportunities and the dangers of the network, it is necessary to ‘examine everything,’ conscious that we will find counterfeits, dangerous illusions, and snares to be avoided,” he cautioned. Pope Francis then explained the challenges in digital communications faced by the Church. “This is not to say that the presence of the Church on the internet is useless; on the contrary, it is indispensable to be present, always with evangelical style,” he noted. The Pope closed his audience by thanking the members of the Pontifical Council for the Laity for their work.